The jewelry retailer's Glens Falls location will also celebrate its two-year anniversary with a reception open to the public. Northeastern Fine Jewelry has much to celebrate this month, and they’re extending an invitation to all fine jewelry aficionados in the greater Capital Region and beyond. 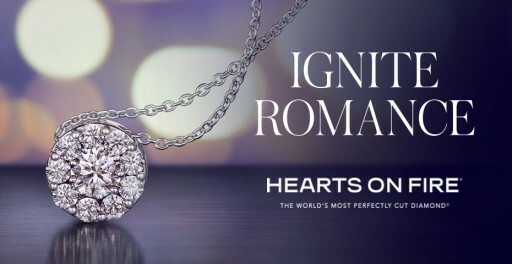 Hearts on Fire, the fine jewelry brand renowned for creating “the world’s most perfectly cut diamond,” has made its return to Northeastern Fine Jewelry’s Schenectady location. Now, local jewelry lovers can browse the designer’s collection of diamond-studded wedding bands, engagement rings and fashion jewelry pieces. For those who were a fan of the jewelry pieces celebrities wore this awards season, look to Hearts on Fire’s fashion collections for styles straight from the red carpet; the Lorelei chandelier diamond earrings donned by Jane Seymour at the Oscars, for example, can be found at NEFJ’s Schenectady storefront starting this month. The new Hearts on Fire additions, coupled with NEFJ’s already-expansive inventory, ensures that anyone coming to the New York-based retailer will have everything they need to look their best for any special occasion. Additionally, Northeastern Fine Jewelry will celebrate the two-year anniversary of their Glens Falls showroom on March 16 from 12-4 p.m.
For those who attend, there will be live music courtesy of Rich Ortiz, great food options, wine and champagne, as well as giveaways held every 30 minutes. The retailer will also give out discount scratch-offs all day while supplies last, so make sure to stop by the event early to take advantage of these savings. An RSVP is highly recommended for the Glen Falls anniversary party, so those interested in stopping by should contact the store directly. To learn more about Northeastern Fine Jewelry’s products or event calendar, contact them at 1-855-795-NEFJ or send an email to info@nefj.com. Established in 1980, Northeastern Fine Jewelry is the source in the greater Capital Region area for designer engagement rings, wedding bands, fashion jewelry, luxury Swiss-made timepieces and GIA-certified loose diamonds. Located in Schenectady, Albany and now Glens Falls, New York, Northeastern Fine Jewelry extends a number of fine jewelry services including full-service jewelry and timepiece repairs, custom jewelry design services, as well as professional appraisal services done entirely on-site. For more information on the sales, promotions, events and products available at Northeastern Fine Jewelry, please visit NEFJ.com, call 1-855-795-NEFJ or visit either of their Schenectady, Glen Falls or Albany, New York, showrooms today.